Those of you who follow my blog have come to know that when I learn a product (like Adobe SiteCatalyst), I really get to know it and evangelize it. Back in the 90’s I learned the Lotus Notes enterprise collaboration software and soon became one of the most proficient Lotus Notes developers in the world, building most of Arthur Andersen’s global internal Lotus Notes apps. In the 2000’s, I came across Omniture SiteCatalyst, and after a while had published hundreds of blog posts on Omniture’s (Adobe’s) website and my own and eventually a book! One of my favorite pastimes is finding creative ways to apply a technology to solve everyday problems or to make life easier. 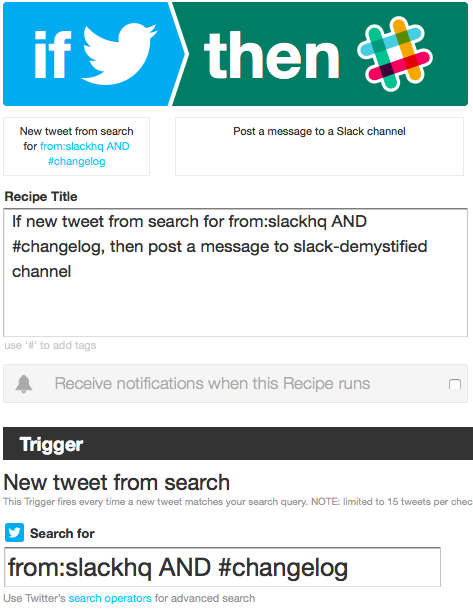 If you have not yet heard of Slack – you will soon. It is one of the hottest technologies out there right now (started almost by accident), and has the potential to change the way business gets done. 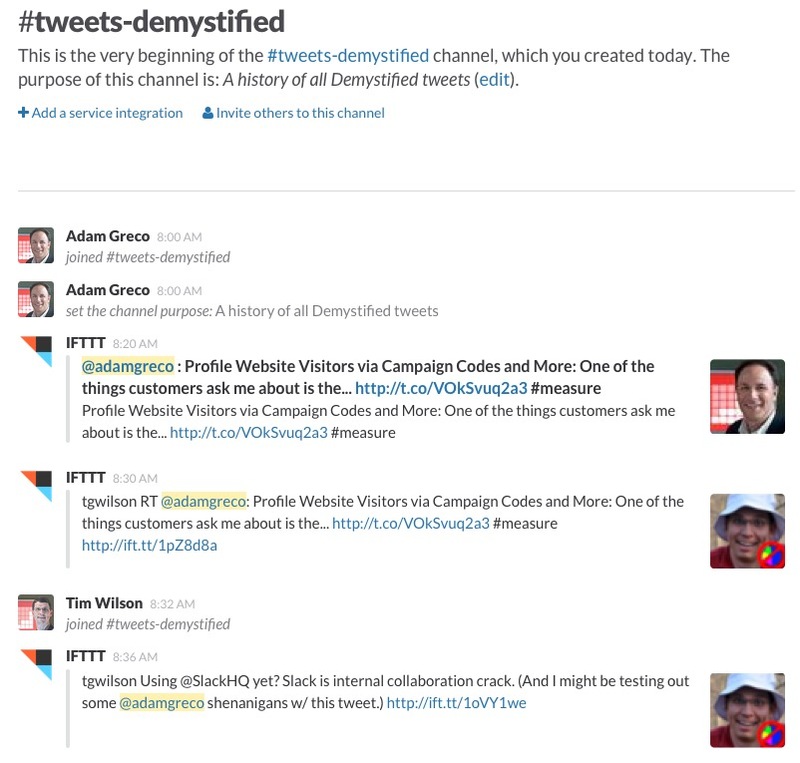 Slack is a tool that allows teams to collaborate around pre-defined topics (channels) and private groups. 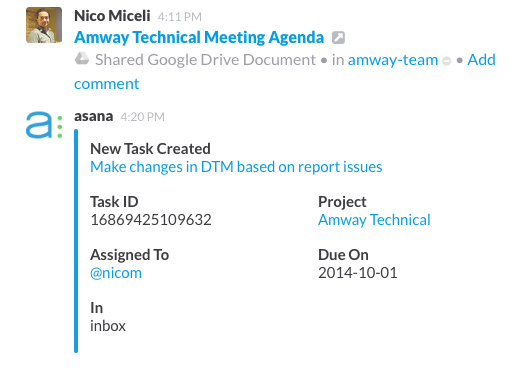 It also provides direct messaging between team members and integrations with other technologies. I think of it as a team message board, instant messaging, a file repository and private group discussions all in one place. That sounds deceptively simple (like its interface), but it is extremely powerful. Most people work with a finite number of folks on a daily basis. Those interactions take place in face-to-face meetings, e-mails, file sharing on dropbox, phone calls and often times instant message interactions. Unfortunately, this means that you have to constantly jump between your phone, your e-mail client, your IM client, your dropbox account, etc… Sometimes you may feel like you spend a good chunk of your day just looking for stuff instead of doing real work! 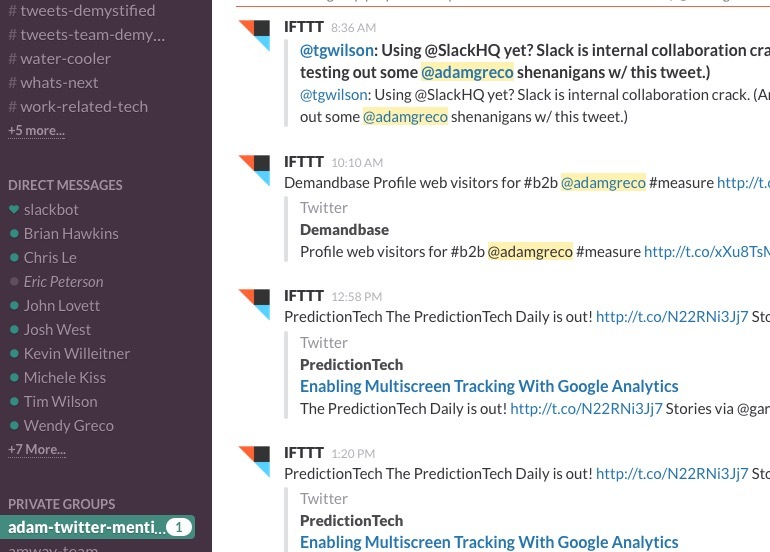 The beauty of Slack is that you can push almost all of these interactions and content into one centralized tool and that tool can be accessed from a webpage, a [great] mobile app or a desktop app (I use the Mac client). 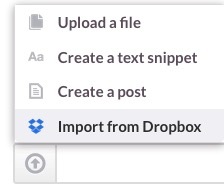 In addition the integrations Slack provides with other tools like Dropbox, WordPress, Twitter ZenDesk, etc… allow you to push even more things into the Slack interface so you have even fewer places to go and find stuff. At our consultancy, we have seen a massive adoption of Slack and our use of e-mail has decreased by at least 75%. If you have kids like mine, who never bother to open an e-mail, but live for text messages, you can imagine that this trend will only continue as the younger generation enters the workforce. The business world moves too fast these days and I think the millennials will flock to tools like Slack in the future. So…in this post, I am going to do what I always do – share cool ways to use technology and share what I have done with it. Please bear with me as I put web analytics on hold for one post! 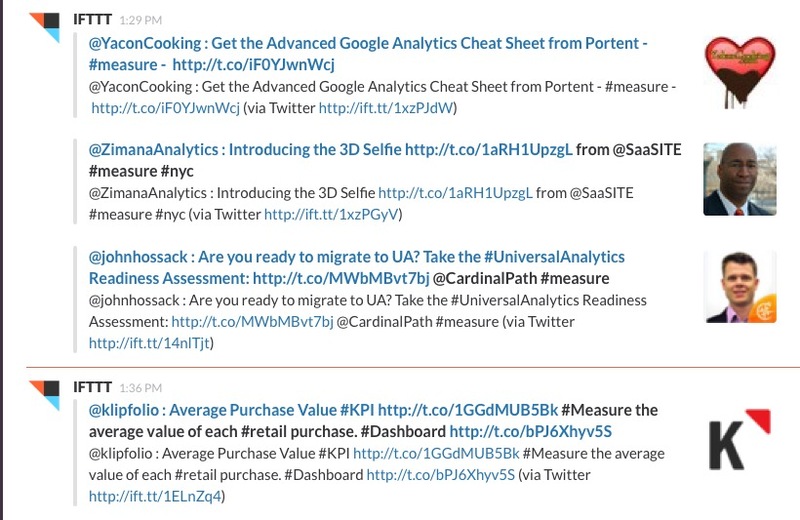 The first way our firm uses Slack is by taking advantage of the “channel” feature. 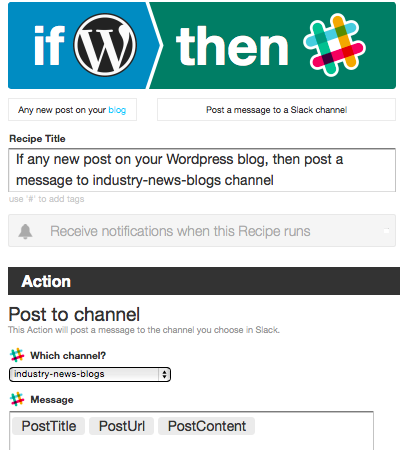 Channels are like bulletin boards with a pre-defined topic. For example, some people at our firm are interested in Adobe Analytics products, while others are interested in Google Analytics products (or both). By creating a channel for each of these, anyone can post an article, share a file, ask a question or share something they learned in the appropriate channel. Everyone within the team has the choice as to whether they want to “join” the channel. If you join the channel, you can see all of the stuff posted there and set your notifications accordingly (determine if you want desktop or mobile notifications- more on this later). You can leave a channel at any time and re-join at any time, and there are no limits on the number of channels you can create (as far as I know). Keep in mind that in addition to text replies, users could have inserted images, files, links or videos into the above thread. Also remember that some of these replies could have come from the mobile app while folks are on the road. 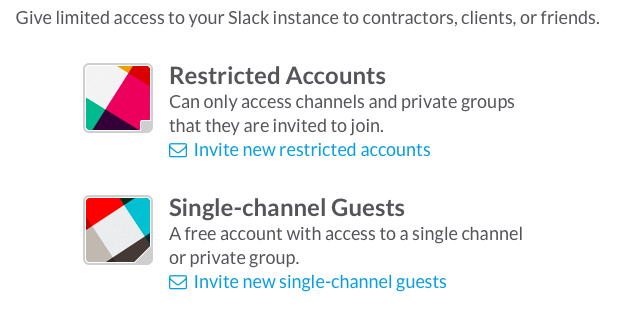 If you want to have a private channel, with just a few folks, you can create a Private Group. Private Groups are like group instant message threads, but can also contain files, images, etc. We use Private Groups for client projects in which multiple team members are involved. In the Private Group, any questions or updates related to THAT client are shared with only those team members who are involved in the project (instead of everyone publicly). Just the other day, we had a client encounter a minor emergency, and immediately our team began discussing options on Slack, came to a resolution and implemented some patch code to fix the client issue. In the past, it would have taken us hours to schedule a meeting, review the issue and figure out a solution, but with Slack the entire process was done in under ten minutes and the client was blown away! Another great use for Private Groups is tele-conference calls. We use this as a “backchannel” when on client calls to chat with each other during calls to make sure we are all on the same page with our responses. 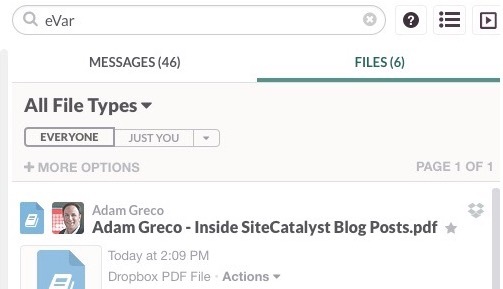 As you can see, there are tons of ways to share files and be alerted when your co-workers are adding files that might be of interest to you and most of them integrate into Slack automatically. Is someone talking about me or re-tweeting my stuff? Are my business partners tweeting? Is there anything going on in the hashtags I care about (though these are becoming SPAM so I care less about this these days!)? As you can see, I now have the things I care the most about in Twitter in the same tool that I am using to collaborate with my co-workers, clients and conduct instant messages. This helps me by reducing the number of tools I have to interact with, but there are other reasons to do this as well. First, The tweets in Slack can be commented on by my partners, which can lead to fun and interesting discussions. 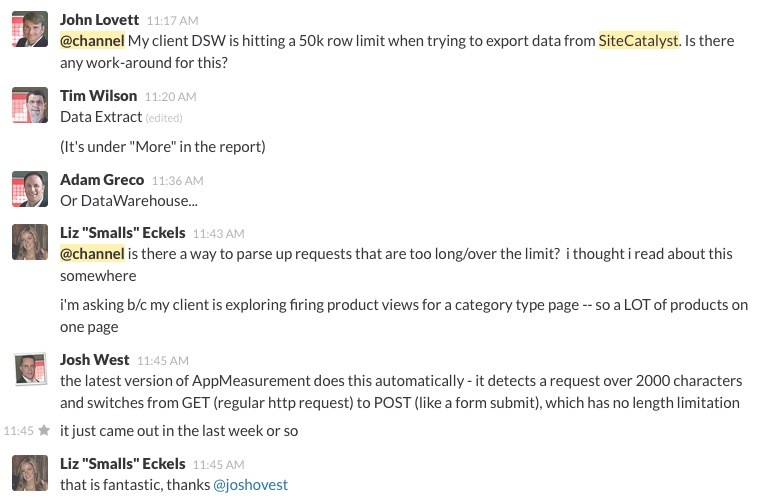 But my favorite reason for doing this is that everything imported into Slack is 100% searchable. In this case, this means that I can search amongst all of my tweets and my co-workers’ tweets from today on, and don’t have to go to different tools to do it. Let’s say I am doing some research on “Visitor Engagement” for a client. 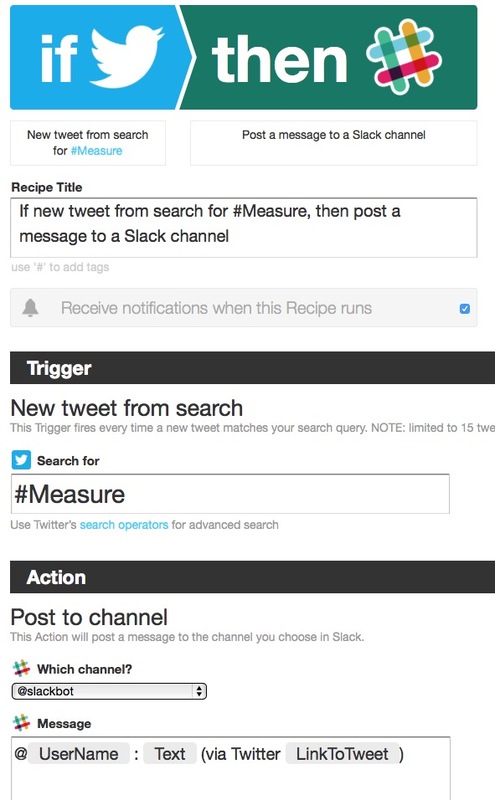 I can now go to Slack and search for “Visitor Engagement,” and know that I will find any discussions, files and tweets that mention “Visitor Engagement” within my company (and if I include the hashtag tweets, I can also see if anyone else in the world has written about it!). That is extremely powerful! Once again, my partners can comment on it and the article text is fully searchable from now on. In my case, I have set-up several of these recipes, such that if I find a good article about Adobe technology, it will be posted to our “Adobe” channel and likewise for Google. 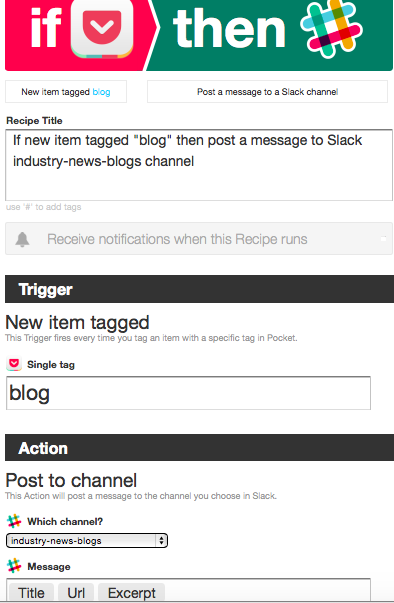 Another type of content that I may want to push into Slack is e-mail. While Slack does reduce e-mail usage, e-mail will probably never go away. 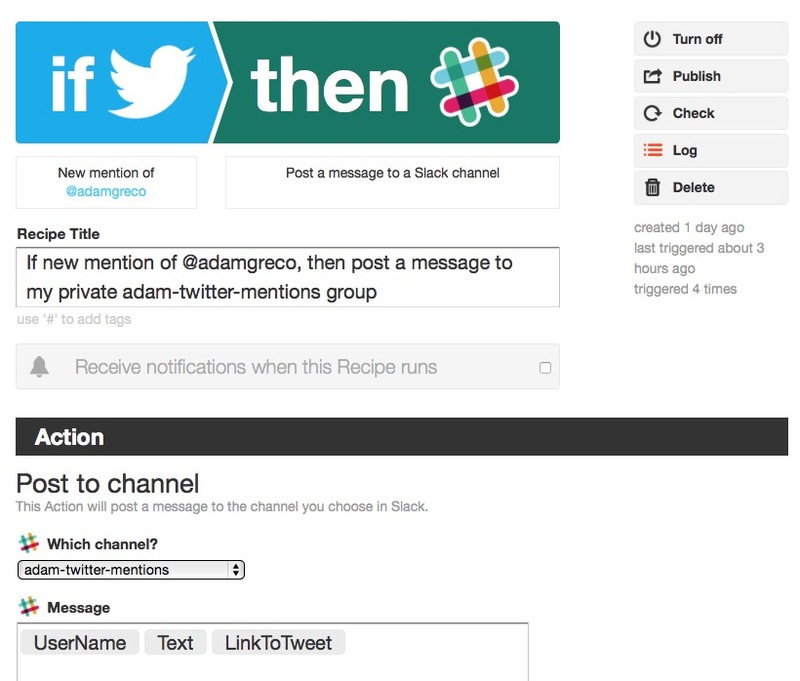 The Slack pricing page states that more e-mail to Slack functionality is coming soon, but in the meantime, I found another way to use IFTTT to send specific e-mails into Slack. Before I show how to do this, let’s consider why sending e-mails into Slack could be worthwhile. In general, I wouldn’t want to clutter my Slack implementation with ALL of my e-mail, but there are times when an important e-mail comes through that may be useful in the future. Perhaps it is a key project status update or approval from your client or boss that you want to save in case the s#%t hits the fan one day! 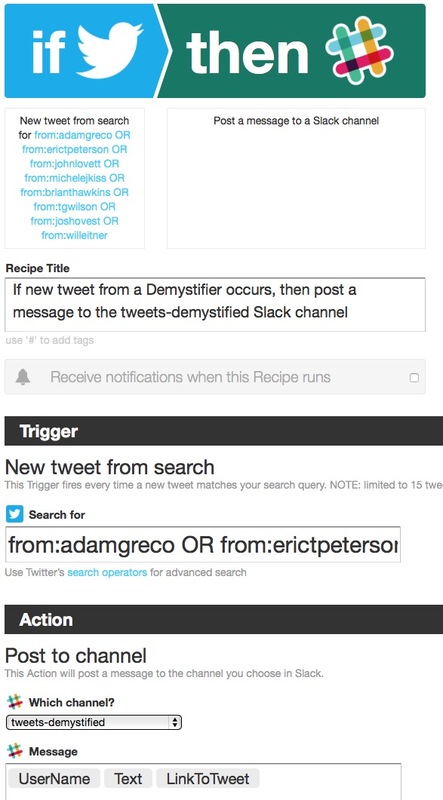 Another reason might be to take advantage of the full-text searching capabilities of Slack so that future searches will include key e-mail messages. 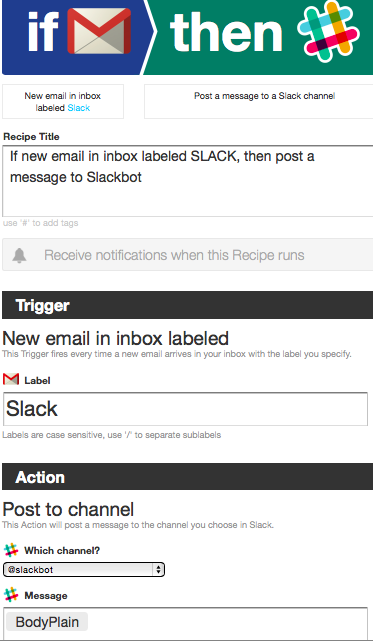 In this case, I am pushing e-mails to my personal “Slackbot” since I don’t plan to do this very often and it is an easy, private place to keep these messages. Of course, I could have just as easily pushed these e-mails into a private group, but for now Slackbot will meet my needs. We use this feature to add clients to private groups for projects. This gives is a direct line to our clients and an easy way for them to post project questions and files. Instead of sending an e-mail and copying tons of people, clients can post a query to the Slack group and know that one of the team members will get back to them in short order. This feature also helps us get around limitations associated with sending large files over e-mail or the need to send secure messages via Dropbox. As you can see, I have had a lot of fun using Slack at our company and pushing all sorts of content into it so it becomes our primary focal point for communication. Unfortunately, due to client restrictions, I can’t show some of the coolest ways we have used the tool, but my hope is that this post helps you see how a seemingly simple tool can do many powerful things when thought of as a central repository for knowledge for yourself and your company. Since Slack is a young company, I am sure that more features and integrations will be forthcoming, but I highly recommend that you check it out (this link includes a $100 credit in case you ever want the paid version) by finding a group of people at your company who need to collaborate on a regular basis or on a specific project. The best part is that you can start with Slack for free and then graduate to the paid version once you are as addicted as I am! 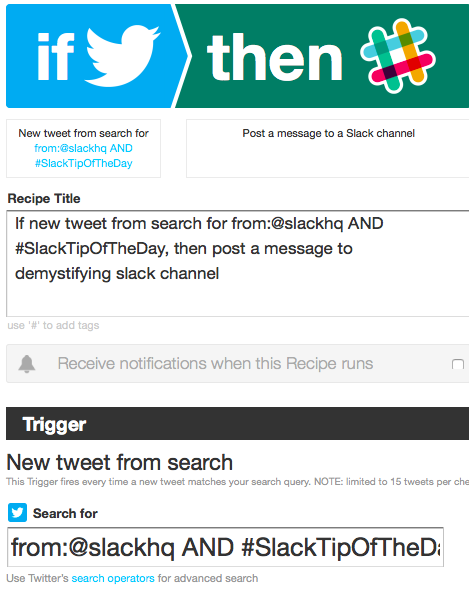 Finally, if you are a Slack user and have found other super-cool things you can do with it, please share those here…Thanks! Adam, you stinker, that was the longest blog post ever! But I read it all the way through because each next thing you said was cooler than the one before. I’ve never used any of these tools, so my mind’s a little blown, but I’m going to start at the top and work my way down!